Out of all the enigmatic entities in the Book of Revelation, only Babylon is called a “Mystery.” And out of all the personage included, the Babylonian entity receives most of the Lord’s attention in the book, with two chapters covering her fall from glory and luxurious living to shame and everlasting ruin. With so much written on Mystery Babylon, several theories have been postulated to expose who exactly the Beast-riding “Mother of Harlots” is. Some interpreters swear that Babylon is the United States of America, with New York City as the ultimate symbol of adulterous and murderous Babylon. Others swear that Babylon is or was Jerusalem, not Rome. Then there are those who make very strong arguments that qualify Mecca in Saudi Arabia as the Babylon of the Apocalypse. So the question is: ‘Who is correct?’ Or, at least, that is how most Bible readers consider the Babylonian controversy. 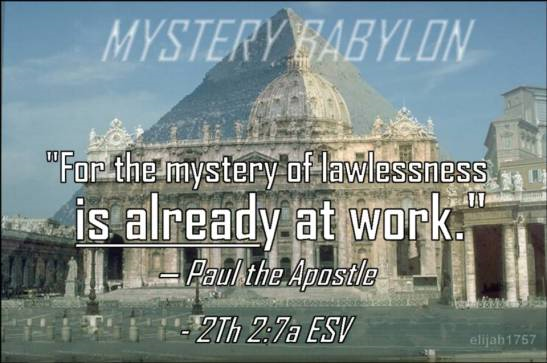 Before we continue on the destiny of Rome as Babylon, and God calling His people to escape her, I, the scribe of these articles, think I should offer my opinion on alternate identities for Mystery Babylon. My opinion is that ancient Hebrew thought and Scriptures are not like Hellenized thinking and writings; the Bible regularly allows for multiple interpretations of its passages, with more than one correct answer. Some interpretations cannot be literally true, if they do not fit all the aspects of a particular passage, but others may also be true if they fit and are found relevant to the subject of the passage. In other words: Scriptures are not always either-this-or-that, as is Greek thinking, but oftentimes biblical passages are more like this AND that (see article on The Original Rock Ripples). Many types of Babylon exist today, and clearly NYC is one of them, but I offer my interpretation of Rome and the Roman Catholic Church as Babylon because I find that it is most fitting historically, via pagan Rome’s persecution of Jews and Christians and thereafter the straying Roman Catholic Church’s even longer history that also includes the torment and murder of Jews and Christians. Thus, although NYC is a slight type of Babylon, the rather young city (in world history) was not founded on seven hills as was The City of Seven Hills. (NB: Revelation’s Babylon is a city that sits upon seven hills.) NYC (and America at large) has not historically been a slaughterer of dissenting Christians and Jews; rather, the opposite is true in its founding and history. Further, NYC has never ridden the biblical “Beast” of ancient empires which persecuted and oppressed the nation of Israel. At best, NYC can only be a type of Babylon. Likewise, Mecca of Saudi Arabia is a type of Babylon and also appears to have pagan Ishtar roots, but it was never founded upon seven hills, and God (Elohim YHVH) does not call His people out of Mecca because none of His people are there. Muslims have never been the elect people of God, but, in fact, they are the children of their false deity Allah (Baal) and the great “False Prophet” of Islam, Mohammad. Thus, although Mecca has lived luxuriously from oil money, has pagan roots, sits in a corporeal wilderness, and Saudi Arabia has sponsored terrorism for killing Christians and Jews, the Arabian city can only fulfill most aspects of the prophecy; it, too, can only be a type of Babylon The Great with paralleling characteristics. Moreover, I believe that the Bible allows for several types of Babylon to come to light before the Apocalypse, and more than one city will eventually be justly destroyed by God because of their evils, but I find the main theme of Babylon in Revelation to be one of Jews and Christians escaping a Babylonian system that is most agreeable with the Roman Catholic Church and the history of the Roman Empire. Revelation is all about exposing the false “Queen of Heaven” (the false “Bride of Christ”) while unveiling the true Bride/Citizenry of the Messiah, who comes to reign from Jerusalem. Hence, Jerusalem, which has also been, at times, unfaithful to God (a religious harlot), will not be destroyed and forever cursed, but, as numerous prophecies proclaim, will be the revealed as the true Bride of Christ after the purging of God’s people and the destruction of Babylonian religious institutions and cities. The Lord has a gathering for His called, from Jews and Gentiles. None of the shepherds have lived-up to His love for His people, and how few have sought to call them back and restore the tribes and Kingdom? Few have cared at all for the folds of the flock, and most have only cared for their own gain from the flocks. History proves this, and the records of their evils have been kept in the mind of God. In no way will He exalt those who have already exalted themselves in honor and richness, even as they trampled upon the Jewish faithful of the flock and the poor of the flock among Christians. How many “shepherds” of the covenants have been so honored by the world for such evil! God, however, honors those who are faithful in works of the heart. Judgment is reserved for the shepherds who have dishonored the Word and people of God to feed their own glory and fatness. Worldly people honor those who exalt and help themselves in this world, even at the expense of others. God, however, honors those who do their works in love for His people. He exalts the lowly and trampled down valleys, and He brings down the high mountains of pride. I am sure that many people will be surprised at who is honored at the Lord’s coming, as well as by the abasement of many whom they expect to be exalted. Those who teach the Bible and guide from God must stand for His truths and His people. For religions around the world are also a type of Babylon, in a system of lies, not merely the R.C.C., and God will bring them all down when His truths are established for the coming Kingdom of Messiah. Reading this passage makes the mind wonder. Can a city fated to meet a quick and tumultuous end become a haunted region of demons and unclean spirits? Can a region become a prison of the dead on Earth- a hell on Earth? Is this what Scriptures infer, as with the body of the Beast that will be being given to the fire? Would it also make sense for a messenger to come and say that Babylon the Great has fallen from grace and has become a throne haunted by the demons of her past? Should it be compared to the spiritual prison of Hades, simply because of all the evils which have occurred in the infamous city? Might she be known by the culmination of her history? Would this go back to ancient days, when Rome was much greater, even making the merchants of the earth rich, covering her whole history, even before the Roman Church? 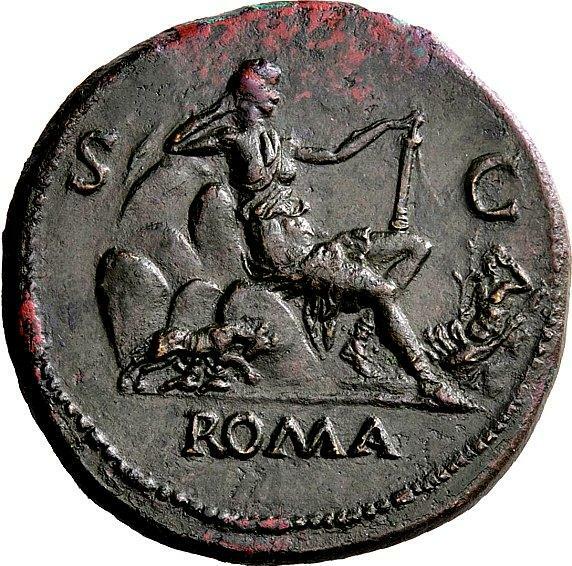 During the first century, when John recorded Revelation, Rome was the trade city of the entire world, but the above description seems to indicate much more, with a spiritual connection to her trade. Also, the wording describing this Apocalypse event- that is, “is fallen, is fallen”- seems to correlate with Prophet Isaiah’s revelations of Halel (or Lucifer) falling from glory into the pit, and Christ’s prophetic vision of Satan falling from Heaven. A reasonable explanation is that some other city in our own age is being alluded to, seeing that Rome no longer makes the merchants of the earth rich through trade, but the fact that Babylon has ridden a Beast of ancient empires leaves room for us to conclude that “is fallen, is fallen” probably suggests Rome’s fall from world center and trade capital to a hated religious city; she is fallen, and the Vatican throne is like a prison or cage, walled in on every side and separated from the world she once ruled; yet many Western nations became rich through her. Hence, there is a sudden fall of Babylon during the Apocalypse, but there is also an historical fall from power and wealth. In the last chapter of Revelation, we were presented a picture of Babylon riding gloriously atop of “the Beast” of empires, and I explained that the depiction is historical, since she has been cast off and has lost her reins of power over the nations. This above passage suggests a city that has fallen both spiritually and economically, and that all of her centuries of fornication with powerful nations cannot save her. The final end comes with sudden destruction, but she, and the King of Babylon, have already fallen off the devouring Beast. One message is very clear: Some of Prophet John’s passages about Babylon are almost verbatim of Isaiah and Jeremiah’s prophecies concerning ancient Babylon’s fall. The Lord reminds His people of how Rome and the Beast of empires compare to His messages to ancient Babylon: The Lord mentioned that His people were led astray by the shepherds, forgetting their “resting place” (Sabbath Kingdom, see Isa. 28:6-13), being “devoured” by enemies (see Jer. 50:6-7). The Lord called His people out of Babylon, for the Lord was raising up nations against the city to plunder it (50:8-10). Babylon would be punished because she was happy about Jerusalem’s fall and was like a fat, thrashing heifer to the Jewish people, provoking God’s wrath (50:11-13). Babylon’s harsh punishment was God’s vengeance for His people, and He would bring back His people, with all of Israel made righteous (50:15-20). Babylon would be made desolate among the nations, and a trap was being set for her (50:23-24). The Lord called for an escape of His people and a return to Jerusalem, for God was going to avenge His Temple, paying her back for what she had done to the Jews (50:27-29). The appointed time came to punish her pride and to make her fall (50:31-33). Babylon was punished for not letting the Lord’s people return to the Holy Land (50:33). The Lord would redeem His people and give the land of Israel rest/Sabbath (50:34). Babylon’s water would be dried-up because of her insanity with images and idols, and she would be overthrown as were Sodom and Gomorrah (50:38-40). The king of Babylon would hear the report and tremble before it happened (50:43). The Lord YHVH called for them to hear His prophecy against Babylon, which would make the earth tremble and cause a cry among nations (50:45-46). In fact, a “destroying wind” would come upon Babylon in the day of doom (51:1-2). Babylon was reminded that God had not forsaken Israel and His people, and that Babylon’s sins have reached to heaven (51:5-9). Jacob- Israel- is the tribe of God’s inheritance, from which He will break evil nations and destroy kingdoms (51:19-20). 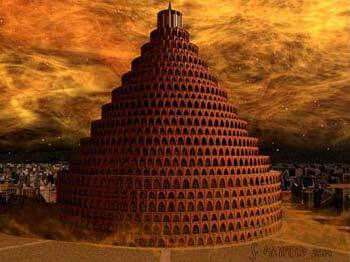 Moreover, God is against the “destroying mountain” of Babylon and would make it a “burnt mountain” (51:25). Babylon would not have a Stone for a corner or a foundation but be desolate forever (51:26). A banner is to be set-up for the nations to see, and a trumpet blown, declaring her destruction (51: 27). The time had come- the 70 years- to thresh and harvest the fruits of Babylon (51:33). Babylon would pay for the blood of Jerusalem, and the Lord would call His people out before her fall (51:35, 45). Babylon would have her walls broken down when she is burned with fire (51:58). I listed these because every one of ancient Babylon’s acts, deserving Divine punishment, mirror the Roman Empire’s history against the Holy Land and the Jewish people. 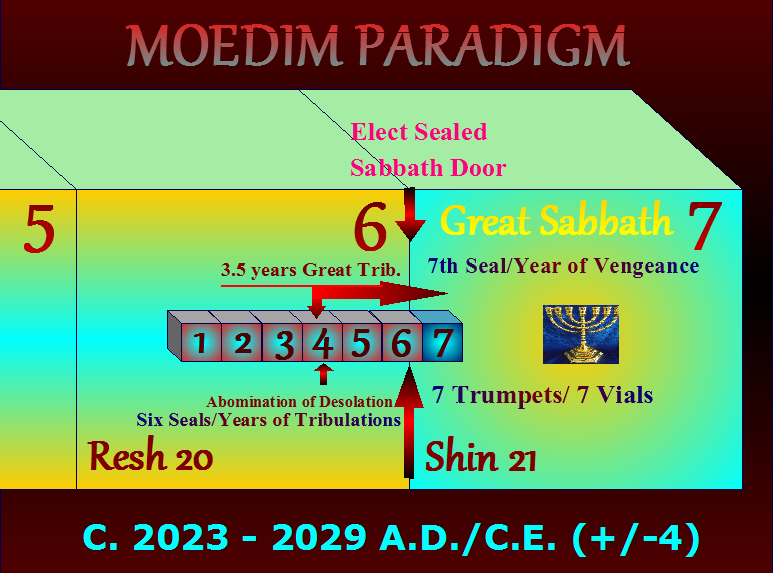 The return of God’s people from Babylon was prophesied to occur in 70 years, but the return from Mystery Babylon is when the 70 x 7 years (490 yrs., with the final 7 years for the Apocalypse), as prophesied by Daniel, are complete. The original seat of the Roman Empire will be destroyed (Rome), just as ancient Babylonia fell and the empire was given to others at the appointed time of calamity. Babylon and the empire of the Beast will be divided into two peoples: (1) those who believe and escape as the ancient Jews did (2) and those who put their faiths in the Beast system and his coming mottled empire. 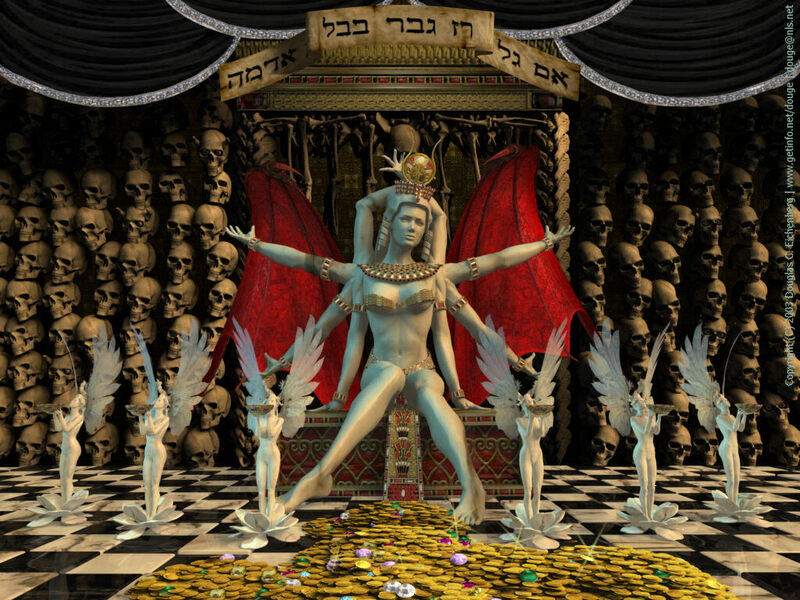 Those who believe and are gathered in meekness are by faith the righteousness of God; those of Babylon who do not believe are given the name of Satan with the mark and will fall with him and his ten-horned empire. However, if there is another reason in our day for God calling His people out of the Roman Catholic Church and decreeing her fall in Rome, it would be their resistance to His will for Jews and Israel. They continue to deny that Christ is coming to reign as “King of Kings” from the city of Jerusalem. In their replacement theology, their papal head sits as a substitute of Christ (a.k.a. Vicar of Christ) in a figurative millennium (A-Millennialism). Hence, the papal head and priests, as well as their scholars, deny the coming Kingdom of Heaven and prophecies of Christ which decree it. Further, the Vatican and has allied with Palestinians to make Jerusalem the capital of a Muslim state. So to this very day, knowingly in rebellion to God or unknowingly in foolishness, they scheme against His will and Scriptures, as an enemy of His throne and the Gospel of the Kingdom. God would not call His people out of Babylon if He did not have people in both the Roman Church and other cities of the Beast. The R.C.C. must be forsaken and fall because of all their past and present evils, even as Jerusalem and the Temple were punished for violence and corruption of the faith when God called His prophets to prophesy against the city that they loved. The Lord does not want His saints to suffer the judgment in which He has determined on Vatican City and the Beast nations that fight against Israel, but they must answer His call to escape. Revelation Babylon, Ray Tracing Comp. To Catholics and other interpreters of Babylon who swear that Jerusalem is Babylon, soon to be punished and never rebuilt (or already destroyed and somehow rebuilt), not Rome, remember the words of Isaiah’s prophecy: Jerusalem, as I have numerously asserted from Scripture, will, in fact, be comforted during the Apocalypse by Prophet Elijah, having already received “double” for her sins (see Isa. 40:1-8). 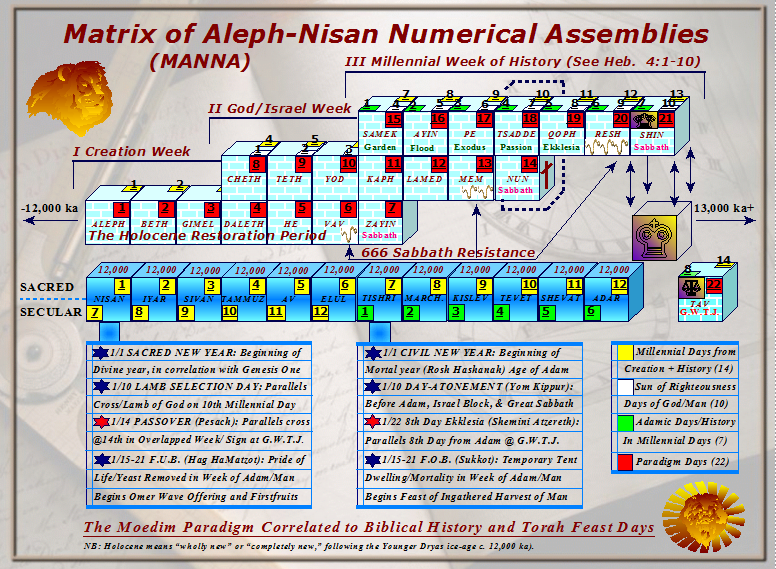 Over and over in these articles, I make mention of what the empires of ancient Babylon and Rome did to the people and holy city (on the 9th of Av). 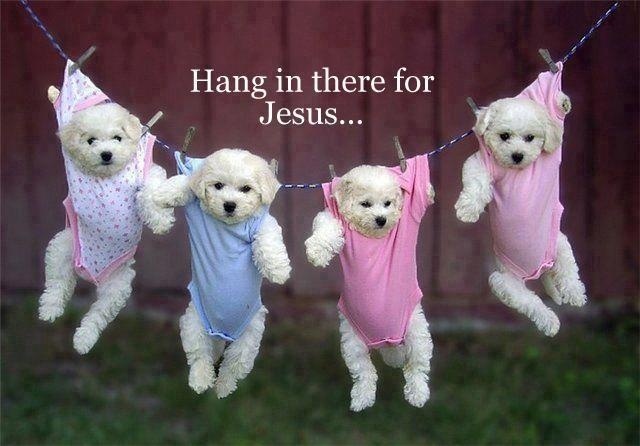 Jerusalem will suffer tribulations but will be saved (see Zech. 14:11-21). As for the Isaiah passage about comforting Jerusalem and preparing the way for the Lord, it could not have been completely fulfilled by John the Baptist, for he did not prophesy comfort to Jerusalem; in fact, he prophesied that the axe was already being laid to root of the tree. And Jerusalem and the Temple were completely destroyed (for the second time) after John was martyred for the faith. Hence, just as Christ comes a second time (first to save the world and warn Jerusalem, second to punish the world and save Jerusalem), the spirit of Elijah returns a second time to prepare His way and comfort the city and people during times of great tribulations. Rome, the true spiritual Babylon, has yet to receive the wrath of the Lord. As was done unto the Jews, so will be done unto Gentile religionists who rebel while claiming the name of the LORD: double wrath according to all their works of evil. The Lord will no longer tolerate the elitist disposition and exaltation of the Roman Catholic Church. She is neither Queen of Heaven nor Bride of Christ. His Bride will be gathered with a pure doctrine of Truth. The Bride will be the sealed with those martyred for the coming Kingdom, restored at the Hebrew roots of apostolic faith. The Lord will gather all who answer the call from the Roman Church and all the straying churches, and the churches will be no more. For “Mystery Babylon” is the mystery of the churches, but the true Ekklesia of Elohim YHVH are sojourners in this present age- as a called-out assembly of those who only follow the Word. They gather to Zion for the return of the Messiah, our King. The good news of Elohim (the Gospel) is that through grace we can all be restored while there is yet time to escape worldly churches and religion for God’s righteous assembly of saints. If not, we will be found spiritually naked and exposed when Christ comes “as a thief” and judges His people and the nations. For almost two millenniums the Roman Catholic Church has claimed to be the only true Church of God, and this view is perpetuated by her many rhetoricians and scholars; all other churches and personal interpretations of Scripture were considered the heresies of infidels. Accordingly, only Catholics hold the promises given to Peter that the “gates of hades would not prevail against her.” All her sins were atoned for, and she would grow to the ends of the earth, never losing her children. She would never lose the Lord as Israel did when they forsook the Messiah; she would never be a widow; rather, she would always remain the glorious Bride Queen of Christ- the Universal Church among the nations. Yet God has said that he will not reason with a man, papal head or priest, over her fate; her sins have reached into Heaven and cannot be atoned for. They are remembered, and there is only an escape offered before ruin. There are not enough bead-rubbings of rosaries, Hail Marys, or confessionals to alter the Lord’s Word and will; her enchantments simply cannot cure her of her sickness; neither has she repented of her false doctrines, idolatry, self-glorification, and long history of atrocities. Her scholars cannot warp and spin the truths of her history away, as if they could deceive God as they have their faithful masses. She has confused herself with the person of Mariam, whom she does not know, and then claims to be “Queen of the Universe” and like terms; but the only truth to her claim is in the meaning of the name Mary, which is bitterness and rebellion. The true Mariam, however, was an ordinary, albeit blessed, Jewish woman needing redemption from her own sins, whose rebellion was against the wicked of the world, as one who loved Scriptures and Israel, her people; whereas, the Roman Catholic Church has a history of persecuting her people and disagreeing Christians behind a façade of meekness, bitterly rebelling against God and His Word for their own glorification. Although Jerusalem was a desolation and widow for centuries while the Gospel spread into the Greco-Roman world, now the tide has turned, as appointed. Now Babylon will be desolate, and Jerusalem will be exalted over the cities of the earth. She who has not carried the Gospel will receive all the children of the faith. Now Jerusalem will be the married wife of the Lord, and Babylon will become spiritually desolate as she was before receiving the children of Israel and the faith of our Lord and Christ. For those who do not comprehend what I am posturing with these Scriptures, it is a scriptural truth, one which proclaims that God will again be called the “Husband” of the nation of Israel. It is a proclamation of passages which affirm that the Lord will once again choose Jerusalem for His throne. No place on Earth, not Rome nor ancient Constantinople, nor any religious city, will again claim to be the chosen or elect Church or place of God. It is finished, and it is already being declared as the will of God by the elect, not by the desire of men. We are declaring that the Scriptures teach an end of all the churches of Babylon, from Rome to religious denominations around the world, declaring that now is the time to bring the fish to the shore and abandon the boats for the coming Kingdom of God. Now is the time of the ingathered harvest, for gathering the elect and teaching scriptural truths of the coming Kingdom. The Scriptures that once favored the churches with grace are now being turned against them for the overflow of unrighteousness and worldliness, idolatry, homosexuality and false doctrines, and again God’s grace has turned His eyes to Jerusalem and the Kingdom that He hastens to bring to fruition. It is not wise for churches to be stubborn and prideful and buck against this, for no one can change the appointed times of God for favoring Jerusalem, and no one can change the ways of our God. It is already appointed, and it is already written in the prophecies. All replacement theologies will fall before the Truth. The glory of the churches is passing into judgment; now the Lord is gathering a Temple of living stones by His Spirit and His Word. The boats were never meant to be part of the Kingdom, only to catch the fish that are being brought to shore and gathered for the Kingdom. None of the churches, from Rome to the Church of England, from Eastern Orthodox to Protestant assemblies around the world, will exist as they currently are during the Great Sabbath of the Christ King; there will be but one Kingdom of saints and one truth taught among the faithful of Jesus Christ. All gathering places that exist from then forward will be extensions of Holy Jerusalem, having one truth under one name. John’s description of ancient Rome can be compared to the treasures and richness of Vatican City today. 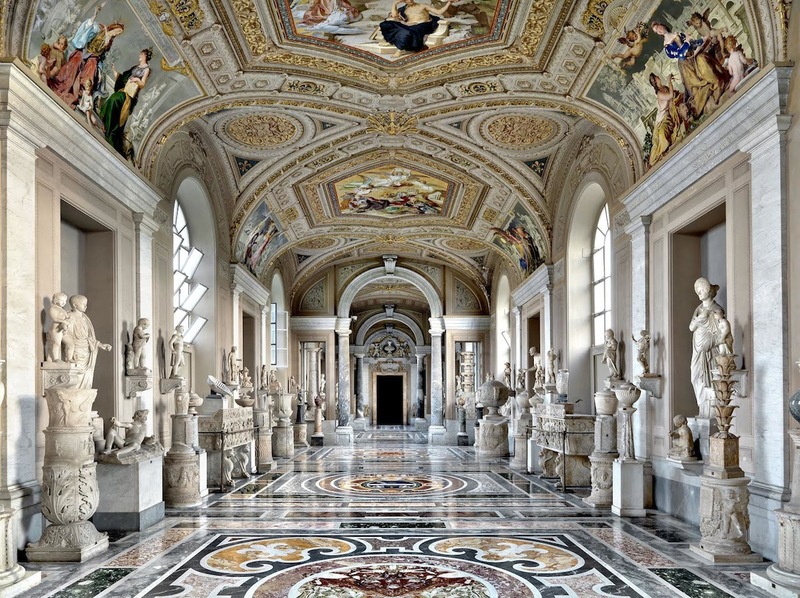 St. Peter’s Basilica is wonderfully luxurious with many priceless and ancient treasures of art. Chambers upon secret chambers of priceless treasures are locked-away inside the Vatican. Priceless works of arts, numerous golden crowns and kingly chalices, ancient relics and treasures from a long history of riding on the Beast, make Vatican City a modern marvel carried forward from ancient glory and richness. How luxuriously the Roman Church has adorned itself over the centuries! Even after being cast off the Beast, she has yet retained so much to marvel over, even being a rich little nation of her own! Nevertheless, the Vatican is not the trade center of the world, unless we count religious tithes and donations from her masses and organizations, which reminds us to expect more than the fall of Vatican City alone. Contemporary Rome will fall, as well as Mecca and indeed cities of the Babylonian system all over the world. Consider how John prophesied that Babylon’s “fruit” will abandon her, in the passage. When Israel escaped from Egypt into the wilderness, they had first borrowed from all the Egyptians, since their taskmasters had grown wealthy from their hard labors. 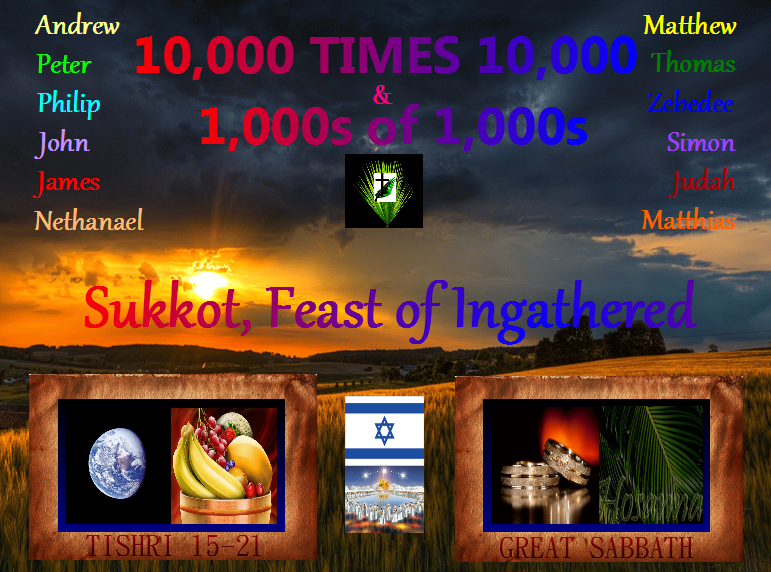 According to numerous Scriptures, the wealth of the Gentiles will be gathered to Jerusalem to adorn the Kingdom of Israel during the Great Sabbath (see Zech. 14:14). Ancient Babylon was plundered by the nations when God called His people to return to Zion. Thus, in the prophecies against Babylonian Rome we find the fulfillment of the foreshadowing escape of the Hebrews. Likely, nations will mourn over the destruction of Rome’s ancient arts and treasures, but wealth will come to the Kingdom of Messiah. Indeed, it is difficult to imagine that the priestly merchants of religion- with about 1.5 billion contributing Catholics in the world and various funding from nations- would not greatly mourn at her fall. I have little doubt that John saw a vision of Rome burning. The Lord showed him a city that he would recognize as the Babylon of his time. According to Church tradition, Rome was where Apostle Peter was crucified upside-down, as was martyred Paul and an untold number of early Christians. Rome, according to Catholic tradition, banished Apostle John to the island of Patmos, where he recorded the Revelation of Christ, and Rome was the center of trade in the ancient world of the prophet. This may be why the apostles and prophets are told to rejoice over her astonishing destruction, as revenge. Although many Christian ministers today call themselves “apostles,” most of us comprehend that biblical apostles were the Jewish (and a few Gentiles) of the early Ekklesia, i.e., those who faced great persecution from the Roman Empire. 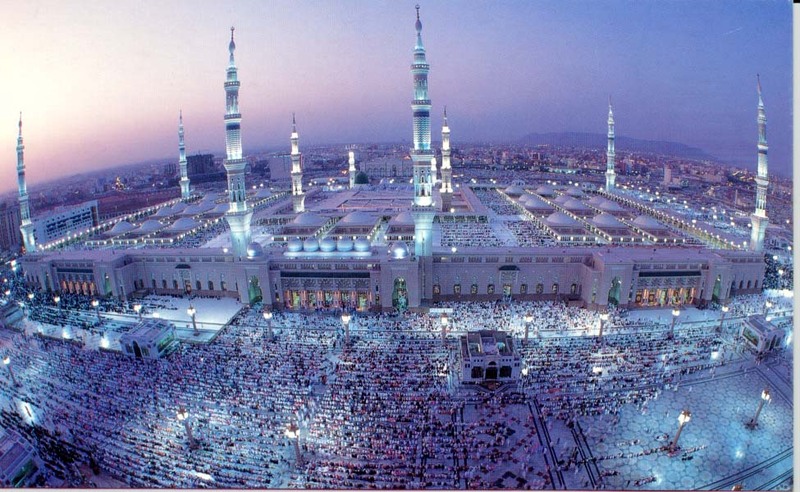 Mecca of Saudi Arabia can also be perceived from parts of the passage, because the city has become rich in marine trade, via oil, but Mecca did not rise in greatness until long after the apostles were tortured and killed; thus, the apostles can hardly ask to be avenged via the destruction of Mecca, although later Christians certainly could. Likewise, apostles and prophets cannot be “avenged” by the fall of NYC or some other trade city, but only by Rome. If we claim that the passage is about Jerusalem being destroyed, we destroy biblical hermeneutics and defy history, for Jerusalem was already destroyed by the Romans (with over 600,000 Jews and those with them slaughtered), and John prophesied about a New Jerusalem with the Temple being measured for rebuilding during the great tribulations. Not only that, but Jerusalem is not a seaside city of world trade. Yet Rome does perfectly fit, although no longer the center of world trade. Rome persecuted prophets, apostles, Jews, Christians, and destroyed God’s Temple and Holy City. And the Roman Catholic Church grew to control Rome and carry on her traditions of slaughtering innocents and luxurious living. Rome will be burned in “one hour” during the Apocalypse. Likely the incineration will be both the secular and so-called “sacred city” of Rome, seeing that the “plague” of fire is something that will be observed from far off, at sea. Jeremiah foretold of a “destroying wind” coming upon ancient Babylon, and in the nuclear age, in which we now live, it makes sense that those who will watch the smoke rising from the destruction from afar off will be afraid of the “plague” of nuclear fallout (see Zech. 14:11-13). The Persians, strengthened by the Medes, defeated ancient Babylon. Today, Iran (Persia) races to achieve nuclear status, seeking to destroy Israel and bring Christian nations into Islamic submission. The “False Prophet” will join with the Beast, bringing fire down from heaven under the authority of the Antichrist. 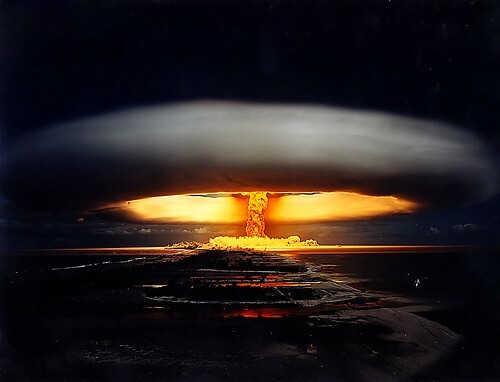 A short buffer of time is all that currently prevents a nuclear war- that and the Holy Spirit. There is a long, ongoing history of war between Muslims and the Roman Catholic Church, and progressive leaders have chosen Islam to help them defeat all Christianity. During the crusades, one good thing that the Catholic Church did was fight back the hordes of Muslims spreading north, seeking to conquer Europe and Judeo-Christianity for Islam, but today the Roman Church can only appease the influx in fear, denying the nature of their historical enemy. Thus, there will be a last crusade when the Roman Church has all of it power completely shattered, and Christians worldwide stand with Christ to defeat His enemies; this one will be won once and for all at the coming of the Great King of Israel. Then everyone in all nations will know who the true God- Elohim YHVH- is. It seems cruel to think that the Lord encourages the saints and apostles to rejoice in the city’s incineration and fall in the Gentile nations of the seas. However, what is an hour of judgment and destruction of the ancient city compared to the many centuries of torture and injustices done by both secular and religious Roman authority? Is it not just for the Lord to remove the religious city and its name at the time of Messiah’s coming to establish a righteous Kingdom? The Lamp of the Lord’s Spirit (the Menorah) is being removed. The Bride and the Groom are departing from her. Solemn music will be silenced. Her great works of art will be destroyed. The Great Stone will not be found in the city, and people will no longer be deceived by her doctrines of primacy. Neither will Greek philosophy (wisdom) come to her aid, as if her teachings can stay the hand of God. 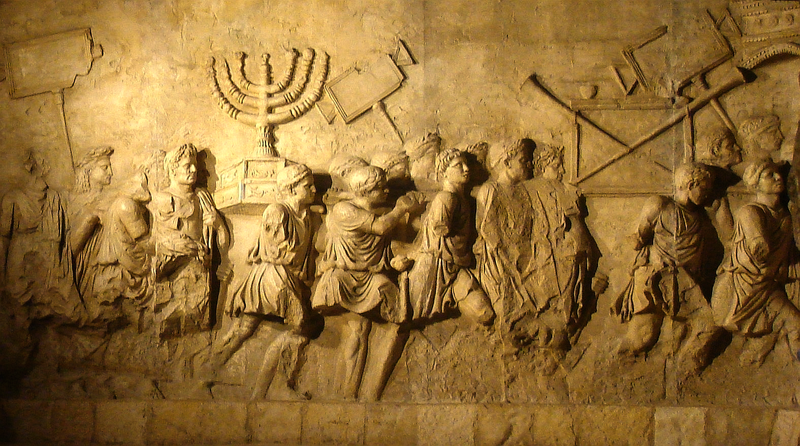 The Menorah was taken from the Temple of Jerusalem to Rome, as seen in the Arch of Titus, and Jerusalem was horribly entreated by Rome; but now the Spirit returns to Jerusalem with the Bride of Christ, and Rome will be as Jerusalem was- made utterly desolate. Before the Lord punished Jerusalem, the Messiah gave a warning that she would pay for all the blood shed on Earth from Able to Zechariah (see Matt. 23:34-38), but now the chalice of blood has been passed for Rome to account for. Jerusalem has already received double from the Lord’s hand, and now Rome will have the blood she has spilled required of her. She will no longer be able to claim the blood of atonement, for the Age of Grace to Gentiles comes to an end. The world has “broken the everlasting covenant,” as Prophet Isaiah prophesied for the end of the age. For those who believe the Scriptures, there is no reason for you to suffer with Vatican City or the renegade churches for their past crimes, which God has remembered. With the Moedim Paradigm, I have revealed the approximate time to escape. I ask you all to believe in the Word of God and see; His words always come to pass. His appointed times are guaranteed. His judgments are manifest through the prophets before they happen. If you fear God, make another place your home; the years left until the indignation is accomplished are passing quickly. Forty years passed from the time that the lambs of Passover were first slain until the elect nation entered the Promised Kingdom with Joshua. Remember the 40 Jubilee Years (2,000 yrs.) from the sacrificed Lamb of God, and save yourselves from the burning flames; do not let your friends sit foolishly as Jericho did, to battle the will of God, but call them to escape. To the best of my knowledge, Okinawa was not given warnings from the Lord, neither was Hiroshima before atomic bombs incinerated the cities. Many world cities have crashed and burned, been invaded by armies, flooded, and decimated in earthquakes for millenniums, having not received Divine warnings; but to Babylon comes a long warning for people to escape. Remember, Christ warned Jerusalem that the generation would not pass before Jerusalem would be invaded and the Temple destroyed; all the blood was required of that generation; then, when 40 years had passed from the time of the Passover, only Christian Jews, believing the prophecies, escaped from Jerusalem to Pella of Jordan. Moreover, we cannot trust religious heads to support us, but God has given us a line of measurements in “signs of the times” to hang our trust upon. Trust in Him and His Word. Lean upon God, and live by heeding His prophetic Word.